MANILA, July 27 -- Malacañan on Thursday welcomed the Social Weather Station Survey (SWS) showing the lowest hunger incidence in 13 years. Based on the SWS survey, families experiencing involuntary hunger at least once in the past three months dropped from 11.9 percent in March 2017 to 9.5 percent in June or a 2.4 percent decline. 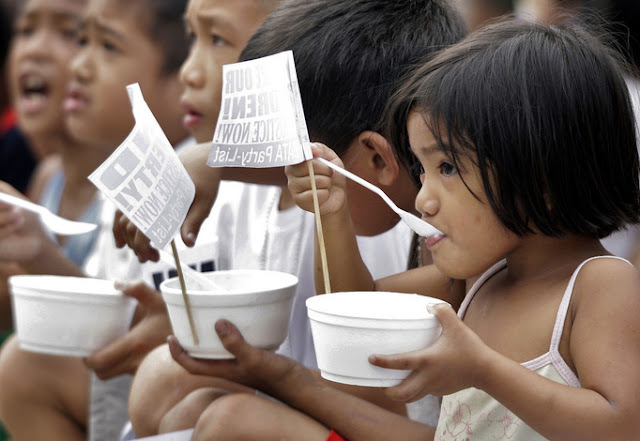 “It’s the first time since 2004 that Filipino families experiencing hunger fell to a single digit,” Presidential spokesperson Ernesto Abella said in a press briefing. “We have certainly made significant headways in alleviating poverty and bringing prosperity in our first year in office. Much needs to be done but with the support of all sectors, we can make a comfortable life for all a reality,” he said. Meanwhile, Abella said the Civil Aeronautics Board (CAB) has approved the 20 percent discount for senior citizens and persons with disabilities (PWDs) for online travel booking. With this, senior citizens and PWDs are entitled to the 20 percent discount on domestic flights. “Airlines are expected to fully implement a virtual system, which should apply discount on online transactions. Meanwhile, a summary of amount indicating the 20 percent discount should be presented to the senior citizens before the completion of transaction. In return, necessary IDs are expected to be presented,” Abella said. In the same briefing, Philippine Sports Commission (PSC) chairperson William Ramirez underscored the need to improve the country’s sports development programs, especially in far-flung areas of the country. Ramirez said his agency is focusing on grassroots sports programs, adding that they have set up sports activities for bakwit children in Marawi.